Subsidence is the sudden sinking or gradual downward settling of the ground's surface with little or no horizontal motion. 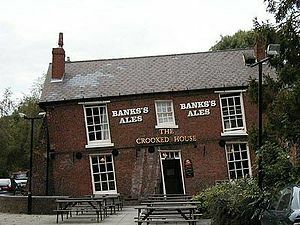 The definition of subsidence is not restricted by the rate, magnitude, or area involved in the downward movement. It may be caused by natural processes or by human activities. The former include various karst phenomena, thawing of permafrost, consolidation, oxidation of organic soils, slow crustal warping (isostatic adjustment), normal faulting, caldera subsidence, or withdrawal of fluid lava from beneath a solid crust. The human activities include sub-surface mining or extraction of underground fluids, e. g. petroleum, natural gas, or groundwater. Ground subsidence is of global concern to geologists, geotechnical engineers, surveyors, engineers, urban planners, landowners, and the public in general. 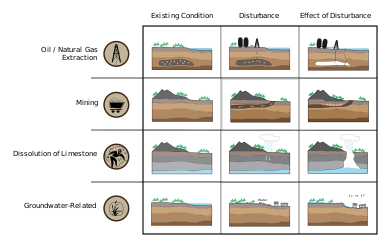 Several types of sub-surface mining, and specifically methods which intentionally cause the extracted void to collapse (such as pillar extraction, longwall mining and any metalliferous mining method which uses "caving" such as "block caving" or "sub-level caving") will result in surface subsidence. Mining-induced subsidence is relatively predictable in its magnitude, manifestation and extent, except where a sudden pillar or near-surface underground tunnel collapse occurs (usually very old workings). Mining-induced subsidence is nearly always very localized to the surface above the mined area, plus a margin around the outside. The vertical magnitude of the subsidence itself typically does not cause problems, except in the case of drainage (including natural drainage)–rather, it is the associated surface compressive and tensile strains, curvature, tilts and horizontal displacement that are the cause of the worst damage to the natural environment, buildings and infrastructure. Since exploitation of the Slochteren (Netherlands) gas field started in the late 1960s the ground level over a 250 km² area has dropped by a current maximum of 30 cm. Land subsidence can occur in various ways during an earthquake. Large areas of land can subside drastically during an earthquake because of offset along fault lines. Land subsidence can also occur as a result of settling and compacting of unconsolidated sediment from the shaking of an earthquake. The Geospatial Information Authority of Japan reported immediate subsidence caused by the 2011 Tōhoku earthquake. In Northern Japan, subsidence of 0.50 m (1.64 ft) was observed on the coast of the Pacific Ocean in Miyako, Tōhoku, while Rikuzentakata, Iwate measured 0.84 m (2.75 ft). In the south at Sōma, Fukushima, 0.29 m (0.95 ft) was observed. The maximum amount of subsidence was 1.2 m (3.93 ft), coupled with horizontal diastrophism of up to 5.3 m (17.3 ft) on the Oshika Peninsula in Miyagi Prefecture. Groundwater-related subsidence is the subsidence (or the sinking) of land resulting from groundwater extraction. It is a growing problem in the developing world as cities increase in population and water use, without adequate pumping regulation and enforcement. One estimate has 80% of serious land subsidence problems associated with the excessive extraction of groundwater, making it a growing problem throughout the world. Groundwater fluctuations can also indirectly affect the decay of organic material. The habitation of lowlands, such as coastal or delta plains, requires drainage. The resulting aeration of the soil leads to the oxidation of its organic components, such as peat, and this decomposition process may cause significant land subsidence. This applies especially when groundwater levels are periodically adapted to subsidence, in order to maintain desired unsaturated zone depths, exposing more and more peat to oxygen. In addition to this, drained soils consolidate as a result of increased effective stress. In this way, land subsidence has the potential of becoming self-perpetuating, having rates up to 5 cm/yr. Water management used to be tuned primarily to factors such as crop optimization but, to varying extents, avoiding subsidence has come to be taken into account as well. Wikimedia Commons has media related to Subsidence. ^ Galloway, D.L., Jones, D. R. and Ingebritsen, S. E., 1999. Land subsidence in the United States. Circular 1182. US Department of the Interior, US Geological Survey, Reston, Virgina. 177 pp. ^ National Research Council, 1991. Mitigating losses from land subsidence in the United States. National Academies Press. 58 p.
^ Herrera, G.; Tomás, R.; López-Sánchez, J.M. ; Delgado, J.; Mallorquí, J.; Duque, S.; Mulas, J. Advanced DInSAR analysis on mining areas: La Union case study (Murcia, SE Spain). Engineering Geology, 90, 148-159, 2007. ^ "Graduated Guidelines for Residential Construction (New South Wales) Volume 1" (PDF). Retrieved 2012-11-19. ^ G. Herrera, M.I. Álvarez Fernández, R. Tomás, C. González-Nicieza, J. M. Lopez-Sanchez, A.E. Álvarez Vigil. Forensic analysis of buildings affected by mining subsidence based on Differential Interferometry (Part III). Engineering Failure Analysis 24, 67-76, 2012. ^ "Earthquake Induced Land Subsidence". Retrieved 2018-06-25. ^ 平成23年(2011年)東北地方太平洋沖地震に伴う地盤沈下調査 [Land subsidence caused by 2011 Tōhoku earthquake and tsunami] (in Japanese). Geospatial Information Authority of Japan. 2011-04-14. Retrieved 2011-04-17. ^ R. Tomás, G. Herrera, J.M. Lopez-Sanchez, F. Vicente, A. Cuenca, J.J. Mallorquí. Study of the land subsidence in the Orihuela city (SE Spain) using PSI data: distribution, evolution, and correlation with conditioning and triggering factors. Engineering Geology, 115, 105-121, 2010.